Lactoferrin is also used by sufferers of chronic fatigue syndrome and by those susceptible to iron deficiency (certain women, elderly people, vegetarians). Lactoferrin thus offers numerous health-protective effects. 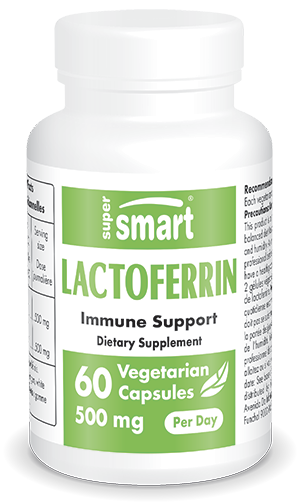 Other powerful antioxidants that support lactoferrin are also available in the SuperSmart catalogue. Reishi extract, for example, is a fungus known for its antioxidant activity and multiple protective benefits. In addition, the anti-ageing formulation Resveratrol Synergy contains a selection of potent antioxidants which in particular include transresveratrol, quercetin and vitamin C.